Normally speaking, it is extremely hard to insert flash to some blog, website and video takes lots of space of saving website. But some times, we need to insert some flash effect to website to show something more vivid. In this article, I will show you another way to insert flash to website. We can convert flash to animated gif image file and the create slideshow from animated image from flash. By the created slideshow, we can insert it to any blog, website easily. This method needs two software: VeryPDF Flash to Animated GIF Converter(this is shareware and sells at $19.95) and LW Photo Slideshow（this is totally free website slideshow maker. Step 1. Convert Flash to animated gif image. Download Flash to Animated GIF Converter. This is GUI version software, when downloading finishes, there will be an exe file. You need to install this software by double clicking the exe file and following installation message. When installation finishes, there will be an icon on the desktop, by which you can launch this software easily. The following snapshot is from the software interface, please have a check. Simply add video to software interface and click option button to do the setting part. Once you add flash to this software, it will be played automatically on the software interface. And by this software, you can convert flash to animated gif as many as you need. When you finish setting part, please click button Convert to run the conversion at once. A few seconds later, you can find the output gif image in output folder. Step 2. 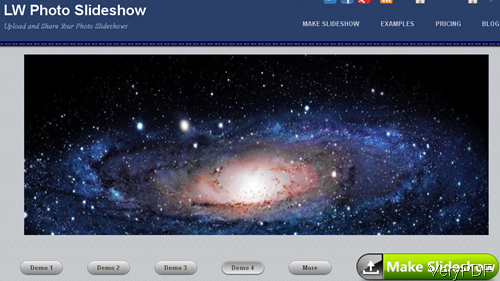 Create slideshow from those animated flash images. Open LW Photo Slideshow and register one account on it. All the registration and using of this website slideshow are totally free, so you can rest assured to use it. When you enter the website then you will see the following snapshot. Please click Demo to check slideshow effect. When you need to create slideshow, please click button Make Slideshow and following steps reminder to make slideshow. Totally three steps then you can make slideshow. During the creating, you can choose templates from 50 more templates. Meanwhile, you can add background music and others. When you finish making, you can upload slideshow to Facebook, twitter and other places, insert it to blog, website. And once making, there will be URL link produced by which you can check the slideshow at any places. Now let us check the slideshow made by this software. I embed it to our blog system. During the using, if you have any question, please contact us as soon as possible. This entry was posted in Flash to Animated GIF Converter and tagged create slideshow. Bookmark the permalink.